Han Solo has always been a bit of a speed demon. From smashing the Kessel run in 12 parsecs to navigating his way through an asteroid field, via all those jumps to hyperspace, you never want to bet against him when he’s behind the wheel. 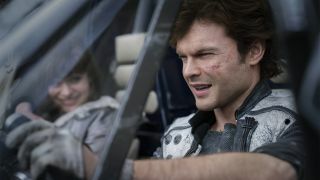 And as standalone spin-off Solo: A Star Wars Story is soon to show (when it opens on May 24), he’s always known his way around a speeder too, a skill presumably picked up during his tough upbringing on Corellia, before he became the roguish smuggler that we’ll meet in A New Hope. Clarke’s Qi’ra has a history with Han, and the film will explore their relationship while also looking at the two key bromances in Han has with Chewbacca (Joonas Suotamo) and Lando Calrissian (Donald Glover). For much more on Solo – including interviews with Ehrenreich, Glover, Suotamo, and Clarke, as well as director Ron Howard – you can pick up this month’s Total Film magazine, which hits shelves (fittingly) this Friday, May 4. Better yet, why not subscribe so that you never miss an issue? Doing so will net you a fancy (and very exclusive) subscriber’s cover (as seen below), and My Favourite Magazines will deliver each new issue through your letterbox every month, for less than the in-store price. What are you waiting for?